The stadium of the nation of Jhess is the grandest arena in all the land. Mubin comes with new as Rafiq says his prayers. Soon there will be a duel where he and Mubin will represent one side of a dispute over land rights of an olive grove. The news is that one of the Blessed caste, Aarsil, has come to see him. "Why has she come personally? She could have sent someone of Mortar caste. We should talk to her. It must be urgent." He tells her she said to wait until after the duel and he smiles, ready to put on good show. There's nothing better than dispensing justice. Ajani is contemplating leaving his pride once again when his childhood friend Zaliki interrupts his thoughts. His wounds aren't something he can hide and she takes him back to her place to clean him up. Despite his attempts to not talk about it she successfully understands the gist of what happened without him really saying a word. How he clashed with someone from their tribe again, and how he thinks it's all his fault, and his tormentors will just get away with everything they've just done. She then starts asking him what he thinks about the future. Where does he see himself. What does he think about the strength of the pride, and what would happen if things changed. She makes him promise that they'll always be friends, and makes him promise to stop being a hero. To survive he should just recognize where the true power lies and get out of the way. 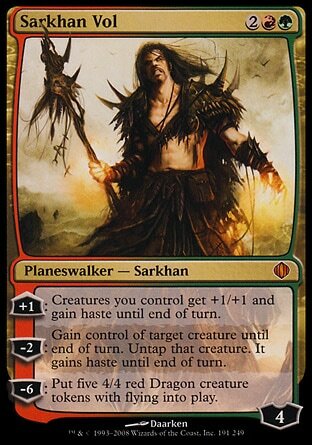 Sarkhan Vol was a great warrior back on his home plane. He was even a honored battle commander for a time, but while he was good at war, it was always dragons that held his passions. Dragons are pure and powerful, and somewhere there is the ultimate dragon that deserves his respect. Once, long ago, he had successfully slain an enemy warlord, but from the tower he looked down upon the battle feeling empty and unfulfilled. Then something happened that would change his life. The spirit of a long-dead dragon had appeared to him, whispered a spell into his mind, and then vanished forever. With the incantation of the spell, a huge dragon made of fire had streaked out of Sarkhan's body, and invaded the battle, blasting the battlefield with a torrent of fire. Fascinated, Sarkhan had watched as his men and those of his enemy were burned to cinders. It was a display of ultimate rage and power that surpassed everything he had ever seen. 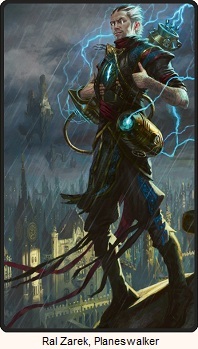 It had stoked a passion in him that had never before flared to life, and along with it, his planeswalker spark. Afterwards, he was relieved of his command, but he didn't care. His search for the ultimate embodiment of rage and power and had begun. He traveled from plane to plane searching for, studying, and sometimes killing dragons. He would find one that was worthy of his worship eventually. 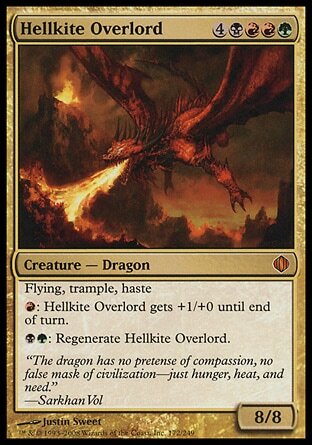 When he came to Jund he found a world filled with dragons like no others. It has been two years since he had come to this plane, and soon he may finally have found the dragon he seeks. Malactoth may be the one. He walks down a lava tube, and to his surprise comes across a dozen people claiming to be hunting the dragon. They warn him to turn away, but he tells them he's killed dragons before and he's not afraid. The strangers decide he can come with them as long as he lays no claim to their glory. When the tube opens up to the dragon's lair, the big man Kresh tells the woman shaman that she should summon her elementals now. But she insists they must go in further towards the volcanic vent next to Malactoth. Sarkhan doesn't care what they argue about. Laying eyes up Malactoth, he sees a glorious hellkite . And it is going to kill them all. The Feast of Marisi begins with the kha telling stories of heroes past, the hadu. On this night it is the story of Marisi the Wild to be told. "Marisi was a warrior," said Jazal. "Like our heroes who provided this feast tonight. But Marisi's was a troubled mind - a mind that could not abide the constriction of law, the law that governed all nacatl of Naya, the cursed carvings we know as the Coil. Marisi believed that we nacatl had forgotten something important about ourselves. He believed that the Coil was like a pestle, and the leadership its mortar, crushing our true natures between them. He believed that the true soul of the nacatl had fled our race, and was determined to put it back again." He tells the story with more flourish than Ajani is used to seeing in his brother, but his energy seems to catch on with the crowd. What sees is a carelessness in his brother as he flails his axe that he's never seen before. But on Jazal goes about how Marisi believed in the freedom from laws and the Coil, and how slowly other nacatl came to understand his words. With his Claw warriors Marisi freed his people and created a new Wild Nacatl nation separate from the Cloud Nacatl. He goes slightly off script and goes on to say that though they are two people they are all nacatl. It is their brethren in the mountain clouds that help shape their identity and so they must be thanked for that. The pride cheers despite his strange additions not as loudly as in the beginning, but they cheer nonetheless. Ajani's brother is a respected warrior, but he also has seen the contemplative thinker that's inside himin private he often thought about the what it meant to be a nacatl and what the divide had really done for their people. Ajani notices that he's not the only one that wasn't cheering much. Zaliki was oddly quiet, and when she sneaks off from the festival, he follows. He catches her sneaking into Jazal's lair and she says it is only to get a talisman she left earlier. She leaves and requests some time to herself and tells him that he should go back and enjoy himself. Ajani isn't ready to leave and he takes a look around his brother's place. In Zaliki's rush to leave she accidentally knocked down a fur hanging. Behind were all kinds of markings and drawings of a white furred lion with a single eye. Ajani is looking at drawings of himself. He finds a scroll and reads about some human religion and their angered god. The humans offer him breadnut and guava, then jade and griffen feathers, but none of it appeases him. It's only when they offer up a pelt of white lion that their god is satisfied. Ajani finds more scrolls and writing among his brother's stuff. Jazal must have been collecting and researching this for a while. Why would he keep this secret? Rafiq sounds a bit wooden... until you imagine Sean Bean of Lord of the Rings and Game of Thrones fame saying the lines. When Boromir/Ned Stark says, "We should talk to her. 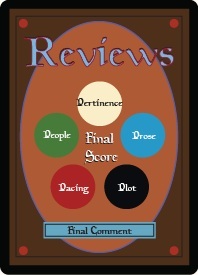 It must be urgent," the lines come across with a lot more intensity than I originally read them. 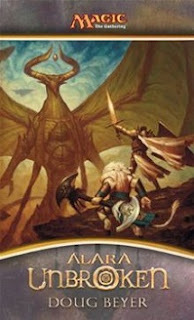 It's quite clear that Zaliki is Nicol Bolas' agent on Naya. If the dialogue is meant to be ambiguous, if we're supposed to believe that Zaliki really is just worried about a friend, it doesn't hide it very well. "Oh, yes," she said. "I merely wanted to... retrieve this, my talisman." She held one of her shamanic talismans in her hand, the one that Jazal had given her, braided with the fur from his own mane. "I was counseling the kha earlier, and... I left it here." Well, he seems straightforward enough. Besides the strange leeway given to him after slaughtering his own men, I'm going to really need more before determining how much I like or don't like him. I believe that he was only relived of command because they were afraid if they tried anything worse he would kill them too.